Having been away with the better half for the best part of 4 days in Edinburgh and enjoying every minute of it, it was time to get back into the angling grove again. Although I need to say that flying last Monday into Edinburgh airport with 70 mph winds made for an interesting experience, also walking around for dinner during the evening even more so. 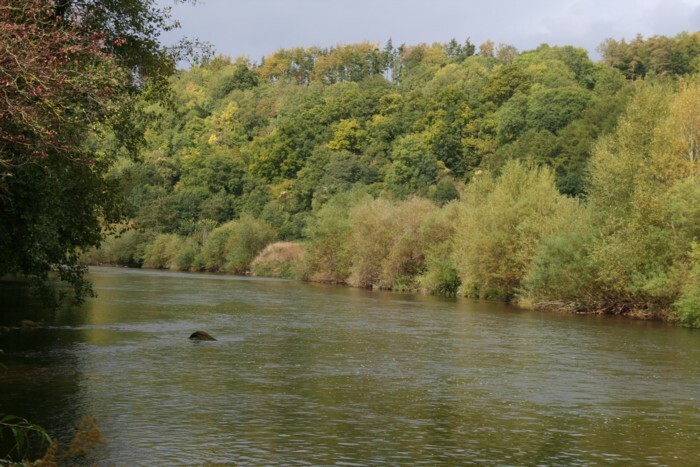 I had been wanting to fish the river Wye for barbel for quite sometime and Tony has a vast amount of knowledge of the different beats that can be fished. Today was the day our plans came to fruition. I picked Tony up at 5.30am and by about 6.45 we were just reaching the stretch we had booked for the day. It’s quite a shallow stretch and one that Tony had fished before. Tony was very generous in putting me in the going swim. Soon we were tackling up with pretty much identical rigs. What a stunning position on the river. My rods were 1.75 fox rods with 12lb line. 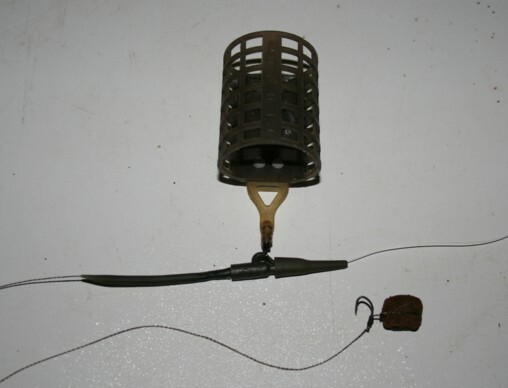 The end rigs consisted of a 60g cage feeder a simple safety clip where it could be used as a running rig or a fixed one. Then about 12″ of ESP sink braid and a new sized 10 Drennan specialist hook followed by a hair rigged pellet. 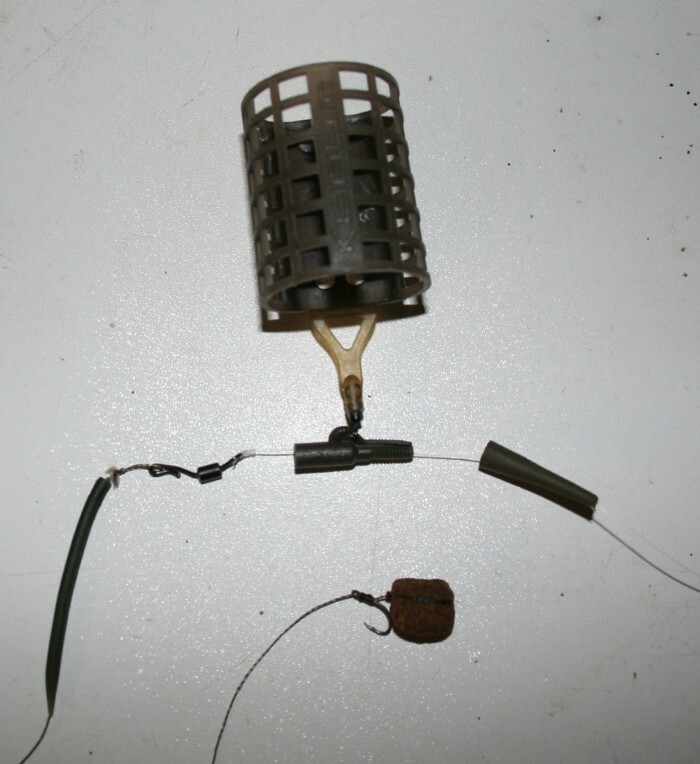 The individual components are shown in the next photo. The aim was to feed pellets, sweetcorn, hemp all bound together with some halibut ground bait. There was slightly deeper gully midstream which would contain the fish in my swim. 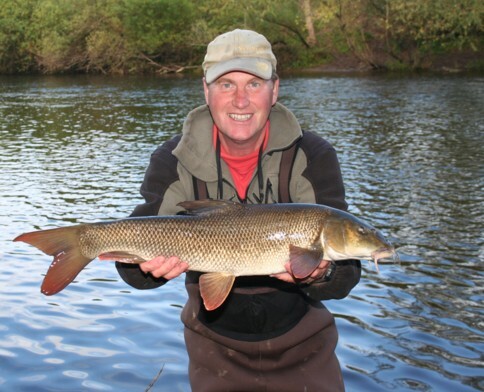 Tony was the first in and landed a nice barbel. I had a couple of tugs then a bite and landed a nice barbel of about 4 lbs. So the first cast produced the results. I preferred to use the free spool facility on my rod which gives line when you get that huge tug. The rods were held very high because there was plenty of weed coming down and this kept the majority of the line out of the water. The next cast produced another bite soon after casting in. I was playing a different sized fish. 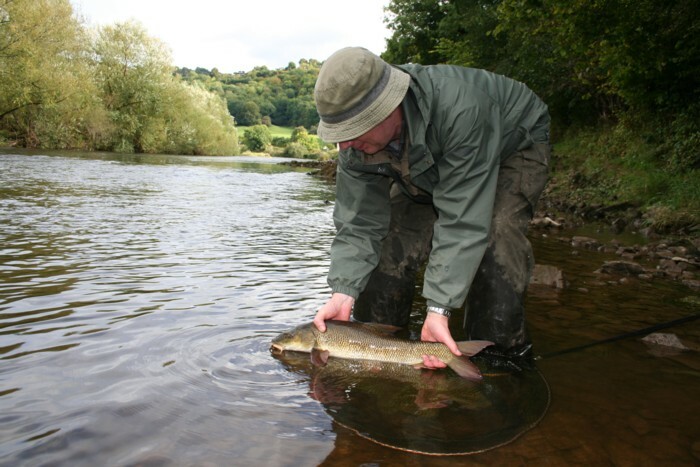 Those Wye barbel really tug you around in the flow. It took line, then I regained it, then it took more, however I soon had it beaten and in the net. I continued to catch and Tony was having trouble so invited him down to fish the top end of the swim. He caught 4 in a very short time so we were both happy catching. Then the canoes started to come down at 10am they were mostly very behaved. I even hooked a barbel as a canoe passed over my rig. However as the day wore on the barbel didn’t want to play although I managed to catch the occasional one. The canoeist basic skills became less. Why they need to turn around in our swim when there are hundred of meters of other river just down stream free of anglers makes me laugh. The number who came down quite clearly out of control and careered into the far bank willows did have Tony and I in fits of giggles. Ruddie the bailiff came down for a chat and told a few of the canoeist off saying the code of conduct is to paddle through the anglers part of the river. It rained on and off for most of the day however we really did have a great time. The sport continued in my swim so I offered Tony the chance to rest his rod on my rod rest while I moved downstream, guest what! Yeah I caught after a very short time. However Tony ended up with a chub and a barbel. I ended the day with about 15 barbel and two chub, mostly were small fish between 1.5 to 4lbs, however I did catch about 3x 6lbers. Tony’s total was half a dozen barbel and a chub. My thanks go to Tony for a great days fishing, it was a pity we packed up at 5pm and not 7pm because we could have caught a few more. This entry was posted on Monday, September 19th, 2011 at 8:31 pm	and is filed under Uncategorized. You can follow any responses to this entry through the RSS 2.0 feed. Both comments and pings are currently closed.